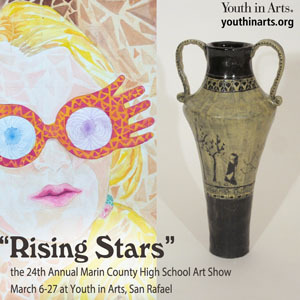 YIA Gallery is hosting “Rising Stars” the 24th Annual Marin County High School Art Show, working with the “Rising Stars” team that has organized the show since 1991. The show will be adjudicated by a panel of local art experts–Kay Carlson, Jay Daniels and Katie Rice Jones–and cash prizes will be awarded to the winning students at a special reception for exhibiting artists and their families on Sunday, March 8 from 2-4 p.m. Winning art will also be exhibited as part of Marin Open Studios this May! Artists Reception (for exhibiting students and their families), Sunday, March 8, 2-4 p.m.
Free public reception for “2nd Fridays Art Walk”, March 13, 5-8 p.m. Thank you to our sponsors–please support businesses that support arts for children in our community!